An electrocardiogram technician is also known as an ECG tech or an EKG technician. An EKG technician has an extremely important role as a member of any healthcare team. Their primary job is to use a device known as an electrocardiograph. They use this device to trace and record any electrical impulses that are transmitted by the patient’s heart. This diagnostic test will actually show the patients heart rate and heart rhythm. After this data is received, it is then presented to the patient’s physician for evaluation. 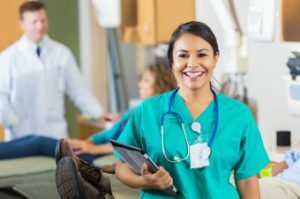 As an EKG technician, you will be able to find work in many places such as hospitals, doctors offices, laboratories, and diagnostic imaging centers. All of these places will provide you with a stable job, and a medical career that can be very rewarding. As electrocardiogram technician, your skills will be in extremely high demand in the coming years. The employment of EKG technicians is anticipated to grow by almost 26% by the year 2016. This job growth is primarily due to the increase in the aging population. This high demand will provide you with a very secure job well into the future. As an EKG technician, you will have an exciting career in a healthcare setting, and you also have plenty of room to advance in your career. Are you interested in how to become an EKG technician? Working as an EKG technician can be a wonderful start to a great career in the medical field. There are many training programs available that can teach you everything you need to know about the technology used and the skills needed in this field. See also this page that lists a few interesting aspects of this profession. Below you will find answers to some common questions about becoming an EKG technician and the training that you will need. EKG Technicians – What Do They Do? EKG technicians help doctors to diagnose conditions of the heart and its vessels. They do this by performing a variety of tests that measure the electrical impulses that travel through the heart and vessels. They perform basic tests as well as more advanced tests like stress tests or 24-hour monitoring. These tests are then read by a doctor who can use the information to determine what conditions may be present how to proceed with treatment. So read on to learn how to get certified as an EKG Tech. What kind of training is needed to Become An EKG Tech? If you would like to learn how to become an EKG technician you will need training. Some technicians receive on the job training, but some prior medical training or experience is usually needed to obtain these opportunities. You must have a high school degree. If you don’t, read here to get an equivalent diploma fast and efficiently. Another option is to enroll in an EKG training program. These programs last anywhere from a few months to a few years and provide training, classroom learning, and practical experience. Training in an accredited program will prepare you to take a certification exam. So there’s no need to stay on a college campus for a longer time. The best training programs are a mix of practical skills as well as anatomy and related courses. The program you are considering will be able to provide current information regarding the length of study and coursework available. Once your EKG technician training is complete you will be ready to get a job. Technicians with the proper training can often find work in doctor’s offices, hospitals, medical clinics and other facilities. Most technicians work directly with patients. You will have the opportunity to be a valuable member of the medical team as you help to administer important medical tests. Once you become an EKG technician, you can work full or part-time and they often have set schedules. Daytime shifts are common, but you may be required to work nights or weekends. How Do I Find An EKG Training Program? There are many wonderful training programs available for those who want to learn how to become an EKG technician. Once you find a few programs you should compare them to find the best one for your situation. Compare a variety of factors, not cost alone, and check out also some available scholarships. Some people find it helpful to talk with current students or recent graduates before choosing an EKG Technician program. Your school should also be able to provide you with information about the courses you will take and the type of training that you will receive. Many schools offer loans or financial aid to help their students afford the cost of the training program. Working as EKG technician can be fun and fulfilling. This is a great career with many possibilities for employment. Completing a training program is a great way to get started in this field and it is the first step for how to become an EKG technician. Find a program near you today and learn more about this exciting field and the opportunities that training may afford you. May 7, 2018 admin Career Comments Off on What does it take to become an Electrocardiogram (EKG – ECG) Tech?